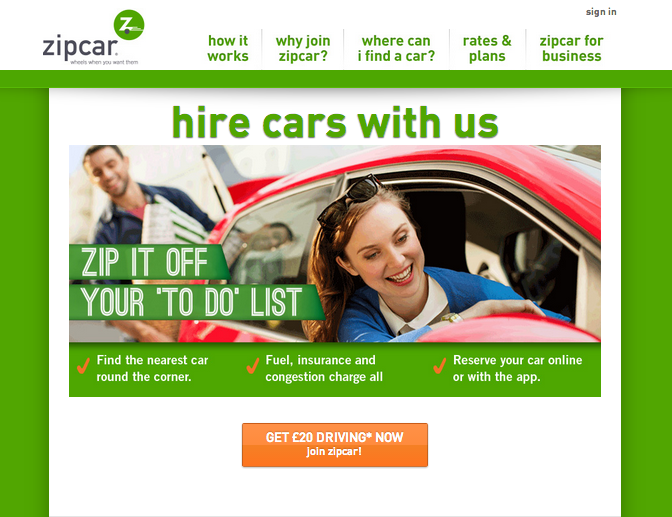 Zipcar.co.uk is a site to find and rent special cars near you, paying an hourly fee to drive them around, from one hour at a time or up to a week. For millions of Londoners, the costs and stress of owning a car in the city just aren’t worth the benefits that come with it. Even so, everybody wants the freedom and mobility it provides, and so turn to companies like Zipcar.co.uk or their competitors. Once registered with the site, for £6 a month, customers can find Zipcars near them, reserve and then take them away using their Zipcard or mobile app. It’s that easy! Occasional driving is also offered for for first-time car sharers. With dozens of different cars and special parking bays all over the city, Zipcar.co.uk makes it easy and cheap to share cars in London, without the stress. While site registration itself takes only a few minutes, time till you begin driving can be long. However, once Zipcar verifies your license details, you’re ready to go! Be very aware of the potential problems, and cover yourself- when returning your Zipcar, if the reserved car rental space is taken by another, ring Zipcar and get assurances that there will be no charge if you are forced to park elsewhere- always take the employee name, and a guarantee that there will be no charge. Similarly, make sure to ring Zipcar.co.uk immediately if you find your car is damaged, dirty or missing- don’t accept charges when it’s not your fault! For those without a car in the city, Zipcar can be a lifesaver: cars anywhere in the city to be picked up and driven can make living in the city easy and simple. Despite a few setbacks like damage and varying prices, Zipcar can save a lot of money over owning a car, and for those currently car-less in London, is definitely worth a look.